I am a first generation homesteader. Well, in a way. The skills I am learning are not new skills. This knowledge I am soaking up about learning to grow vegetables, save seed, preserve my harvest - and raise animals for meat - are all skills my grandparents and great-grandparents definitely had. ...how to peel chicken feet. But me? Well, let me tell you my story. We've been raising chickens since our firstborn was tiny. Both my husband and I had chickens growing up, so raising them for eggs was natural. But neither of us had much chicken farming experience beyond egg production. Once we made the decision to try and grow as much food as possible - we began to see the chickens as more than a hobby. We wanted them to be put to use in every way. As we learned more about soil health and composting, they became even more crucial to our homesteading success. Learning how to butcher our own chickens was another way to make sure we were valuing these animals. You can read more about that process HERE. So that is where we were last year. We had spent a couple of years learning to butcher, process and prepare our own chicken and rabbit which we had raised. It felt good knowing we weren't wasting anything. One secret to a really nutritious bone broth, I'd read, was CHICKEN FEET. They are the hen's best tool to scratch, dig and fling all sorts of things around in the compost pile. And no matter how clean you keep your coop - those claws are going to be downright dirty. Now, not having a relative to pass down this knowledge to me - I was truly mystified. How ON EARTH would I be able to clean those feet well enough to get them anywhere near our food? After burying many feet into the compost pile along with the feathers and innards (from butchering) ... I finally got the courage up to save some for the pot. The girls used a brush and we scrubbed them outside as best we could. Once I got them into the kitchen sink, though - the problem became apparent. These feet have scales, and the scales get dirt and junk under them - kinda like fingernails. (are you gagging yet?) No matter how much I scrubbed, I coudn't get them clean enough. I'd seen chicken feet for sale in Asian markets and even at Natural Food meat counters before - but they didn't look like these. They were clean. What was I missing? I picked up the phone and called my friend Will. I'm grateful to have a few friends with some of this rare homesteading knowledge to share. He tried not to chuckle while I told him I was nearly gagging trying to get these feet clean. What should I do? BOIL THEM for a few minutes. He said. And the outer layer of the feet will peel off like a glove. Well I wouldn't have thought of that. We did as he said, and sure enough - the outer scaley skin layer peeled off - very reptile-like. WEIRD. What came next, Will forgot to mention. The chicken's toenail popped off revealing a totally clean, new one underneath. WHAT?! Learning this new skill somehow warms my heart. It makes me feel connected to the generations that went before me. Sadly, we have about a 100 year knowledge gap in our society. Since the rise of convenience foods, grocery stores, mass produced meat and factory farms, we have all but lost much of this important food knowledge. In case you were wondering, the feet did not add any new or different flavor to our stock. It tasted as delicious as always. I'm wondering if this bizarre sight will become a bit more normal to us with time. Not sure, really. What I am sure of though, is that little by little - the homesteading skills and knowledge that generations past took for granted - are becoming important to many of us again. The difficulty, beauty and artistry of MEAT. Meat. For much of my life it was mostly an object, a thing. Something that we picked up at the grocery store, and which created heavenly aromas from the stovetop, oven or barbeque. There is no denying that we relished it's flavor. But to say I felt the sacrifice of a living creature which died so that I could eat? Not so much. It wasn't until these recent homesteading years that this has become very, VERY real. Butchering our first chickens as a family was a good first start. I'm very comfortable with a whole chicken. I can piece it out into it's parts - legs, thighs, breasts, wings. It's a wonderful simple skill to have. So... the chicken butchering wasn't too traumatic - we learned that the most daunting part (plucking) wasn't actually too hard. The process that took it from being seen as an animal to being seen as food was interesting. It began with an animal we knew, had raised and fed with care. it seemed to magically transform into... well... food! It was that satisfying moment when the last feather was plucked, the feet were clipped off and all of a sudden - voila! The recognizable naked, headless, footless chicken - looked.... edible. And definitely not as intimidating. To my grocery-store trained eye - THAT was food. Raising rabbits has been another step deeper into this intimacy with meat. I have killed, dressed and cooked a chicken on my own. Start to finish. It was an emotional experience to take the life (even of that mean rooster) but I did it. The rabbits are a bit different. I would have to be really hungry to do the killing myself. Having raised them when he was young, my husband knows how to quickly and humanely kill the animal. He removes the head and pelt, guts the rabbit, and places it to chill in cold water. 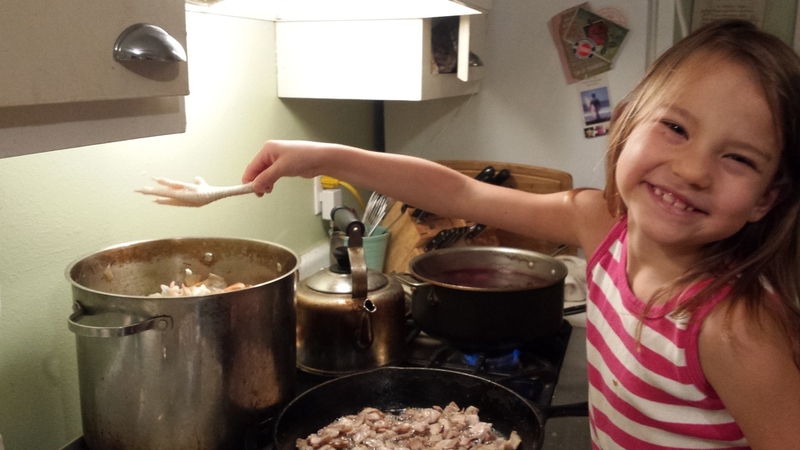 The girls and I work on fleshing and salting the pelts - then move the rabbit meat to the fridge to rest. 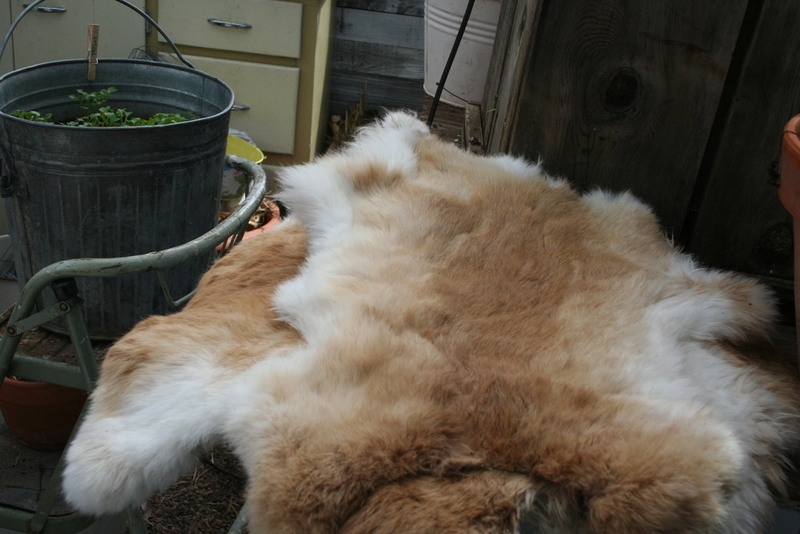 We are experimenting with tanning these gorgeous rabbit hides - hoping to end up with some fur-lined winter caps, ear muffs or fur-lined slippers for next year. Knowing an animal throughout it's life - becoming somewhat attached to it's quirks, or even just the comfort of regularly seeing it on the homestead, makes eating it - different. Because this was the purpose of us breeding these animals - we know this from the start. Still - I must admit to realizing... it is a heavy thing to be a carnivore. There's no denying the visceral experience of piecing out a rabbit, learning at what part of the backbone to cut through the vertebrae in order to divide the pieces evenly. I have a backbone, too ... I ponder. Or removing the legs and thinking of how I watched this baby rabbit bounce sideways with energy in the backyard just a few months before. Here's the difference between the grocery store meat and my own animal's meat: There's a connection. It is no longer just an object. It's a beautiful creature that lived a healthy, happy life under my care. It's also delicious and very nourishing. Because it died so that my family and I could enjoy it as food - it should be respected. And used wisely. I am up past midnight writing this - feeling filled up with inspiration because of these videos from Farmstead Meatsmith. My husband and I had a fabulous time watching them, we kept pausing to talk about what we were learning, how fascinating it was to see each step. These videos are SO educational, artistically done, quirky and just... fantastic. I am struck by the fact that butchery and charcuterie (fancy name for curing meat) have become lost arts in America. I am inspired and look forward to the day when we gather several families together, work hard to slaughter an enire pig, give thanks for the bounty, take care to use every part, and revel in the delicious result. My love for history plays into this emotional evening as well. This year I've been enjoying studying and digging deep into Italy - my relatives, the culture of food and traditions that feel so close to my heart. I can't help but think of how lovely it is to be going back to the way that my grandparents lived. For them, watching a pig killing would have been very normal. And it wasn't only my Italian family that lived this way - but my relatives from both sides of the family. (Don't worry Dad - I haven't forgot your side!) I enjoy reading the details of life on the homestead in Indiana where my father's grandfather lived before moving to California. The fact is, 100 years ago - ALL families knew how to butcher an animal to provide for their needs. In my favorite series "Two Greedy Italians" Gennaro Contaldo and Antonio Carluccio share what it was like for them to take part in a festa del maiale (pig killing). " this is one of the most important scenes in any Italian village, they share. "In our day, everyone had a pig. The meat would feed a family for a whole year. Pig produce is central to the Italian way of eating." Antonio goes on to say that the pig was the 'ultimate sacrifice of the pig for the good of the family'. There's something to stop and ponder. This pig is not simply 'some cuts of meat' - it's not just an object. I love this scene. These two grown men are standing, watching a pig about to be slaughtered. They are being flooded with memories of taking part in this important, but difficult act as young boys. Gennaro winces as the pig is killed (it is not shown on film). He rolls up his sleeves nervously, as if about to help. He goes on to say how he would watch his mama - wondering why she didn't cry. It is emotional. A beautiful animal just died... 'for the good of the family.' In our society, the artisan skills that once could be found in every village - have been taken over by large scale factories. This 'ultimate sacrifice for the good of the family' is done in secret - behind large gates, (often under horrible conditions) and we are sheltered from this important but difficult aspect of our survival. Watching Gennaro make pig's blood chocolate pudding, watching children helping to stuff sausages. These are experiences that I want to have! I yearn for the intimate knowledge of the food that I eat. There is satisfaction in getting your hands dirty, working hard along with family and friends - to put every part of the animal to use. Knowing that your larder is full and you will eat well for the year. Eating the delicious products from an animal that lived a happy life, was treated and fed well - and appreciating it's sacrifice. There is such beauty, enjoyment and richness in taking part of every step of producing food. I hope that my daughters will recall these memories into their old age, and be able to pass them on to their children.